OpenSocial is a framework designed for the creation of socially themed application programming interfaces (APIs). OpenSocial applications, called gadgets, can be used in any web-based application that supports them. They are characterized as simple, widely available, and easy to deploy. Gadgets are especially popular on social networking sites. They can, however, be used in many different ways throughout your site. Gadgets are socially aware and can share data across a community of users. You can define your own groups and create gadgets to communicate information based on pages (community/team pages), applications (gadgets/widgets/portlets), data, users, roles and authorization, and policies. In short, you can develop gadgets to allow individuals to access and share data within their social networks. First, we’ll go through steps to add an Adhoc gadget to a page. Figure 8.12: Configure a gadget to display in your portlet. Figure 8.13: Configuring an adhoc gadget with your portlet is as easy as pasting the gadget’s URL. After pasting the URL into the text field, click Save and your new gadget is visible on your page. 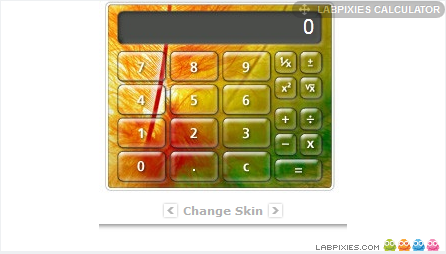 Figure 8.14: The calculator gadget displays seemlessly on your page. This particular gadget allows you to change its “skins” to fit your needs. Likewise, there are many other user-friendly interactive gadgets that give you flexibility to fit them into your themed sites. As you find gadgets that would work nicely throughout your portal, you can publish them for portal-wide use. You’ll learn that next. You can easily make gadgets available for adding to pages as you would any other application. We’ll demonstrate this by adding a To-Do List gadget for portal-wide use. Figure 8.15: Configure new gadgets with ease. Figure 8.16: Publish gadgets for portal-wide use via the OpenSocial Gadget Publisher. Edit: allows you to change the URL or category. Refresh: manually refreshes the gadget cache to reflect changes that have been made to the gadget that may not currently be displayed in the portlet. Permissions: gives you the basic View, Update, Delete, and Permissions options for each role on your site. Delete: removes the listing for the gadget. If you navigate to Add → More → Gadgets, you should see the To-Do List gadget. Figure 8.17: You can conveniently list your gadgets within the Gadgets category. In the next section, we will demonstrate how to share OpenSocial gadgets with other sites. OpenSocial consists of a set of APIs for social networking. Liferay implements the OpenSocial standard, so you can be assured that your gadgets run on Liferay. That also means gadgets hosted by a Liferay Portal instance can be deployed and run in any standard OpenSocial container. It may be beneficial for you to share gadgets from your Liferay server with other sites, such as iGoogle. Google’s iGoogle lets users customize their own page and add gadgets to their page. Your Liferay Portal users can share their portlets and other OpenSocial gadgets on iGoogle or any other OpenSocial-compatible site. Let’s try this now. For our example, we’ll share Liferay’s Loan Calculator on iGoogle. 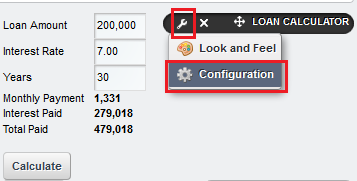 Figure 8.18: Select the Configuration button. 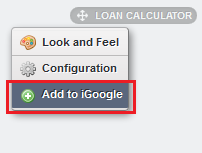 Check the box labeled Allow users to add Loan Calculator to iGoogle. Also, replace “localhost:8080” with the name of your public domain and port. Figure 8.19: Allow users to add your portlet as an OpenSocial Gadget in iGoogle. Close out the window and navigate back to the wrench icon in the upper right corner of your portlet. There is a new option named Add to iGoogle available. Click on this button to add your portlet to your iGoogle page. 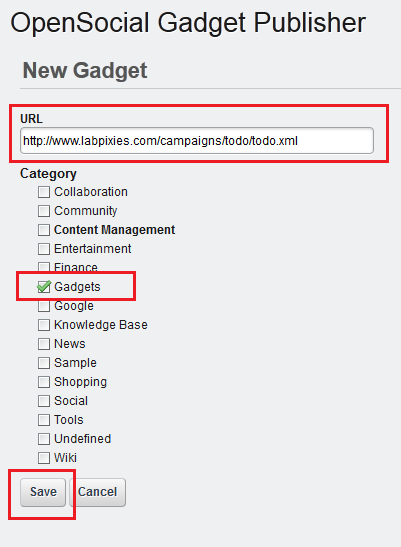 Figure 8.20: Users simply click the Add to iGoogle button to add your portlet to their iGoogle page. Your portlet is now available on your iGoogle page! By going through this process, Liferay shared the URL of your portlet to iGoogle. The URL you provided is unique to your specific instance of the portlet. This allows you to share multiple instances of the same portlet as different Google Gadgets. You could use this sharing capability to let users view what’s happening on your portal at a glance. As you can imagine, you can share all kinds of information from your portal gadgets and portlets with your various circles of friends, colleagues, and fellow community members. Liferay allows gadgets on your site to be personalized with data from third-party applications. Some of the third-party sites that authorize users to access application data include Evernote, Facebook, Google, Netflix, Photobucket, and Yahoo. Of course, many users feel uncomfortable giving away their private credentials to access these applications. Fortunately, Liferay allows you to use OAuth to protect your credentials while you access resources on these sites. OAuth is an open standard that authorizes third-party applications to interact with a user’s resources. Users can share their private resources from one site with another site without supplying typical credentials, such as their user name and password. OAuth uses request and access tokens as well as a token secret to authenticate the users of your gadget. A popular characterization for the OAuth client is the “valet key for your web services.” Let’s say you’re hosting Liferay Portal and have users and customers coming to your web site. You want them to have access to a third party resource, like Twitter, and be able to access their accounts from your site. In the past, they would have to provide their Twitter user names and passwords, but not if you use OAuth. OAuth is a “handshake mechanism” where, instead of requiring personal information, Liferay redirects users to Twitter, where they can tell Twitter to allow Liferay limited access to their accounts. This example is similar to our earlier “valet key” characterization. You wouldn’t want a valet driver opening your glove box, storage spaces, hood, and other personal compartments within your vehicle. You would only want him or her to access things he or she needs to park your car. OAuth is based on this same idea: it allows a site just enough information to do what it needs and nothing more. This assures the user that his personal information is safe but gives him freedom to take advantage of valuable resources he typically uses from the service provider’s site. OpenSocial defines a specification that allows gadgets to incorporate OAuth to access protected resources from service providers. A brief example is provided to demonstrate how easy it is to leverage OAuth within gadgets on your site. 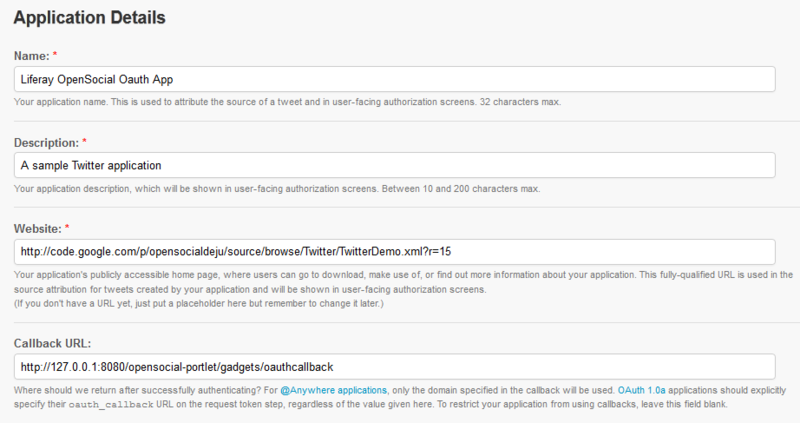 For this example, we’ll set up a demo Twitter account gadget using OAuth. First we must configure your gadget. Follow the steps below to acquire the consumer key and secret given by the service provider. For OAuth-enabled gadgets, you can select the Manage OAuth button from the Actions tab. Select Manage OAuth for your Twitter gadget. As shown below, you have several options under “twitter” that you must fill in to configure your gadget. You must also register your gadget with Twitter to access the Consumer Key and Consumer Secret. Figure 8.21: Twitter allows you to manage OAuth for your Twitter gadget. 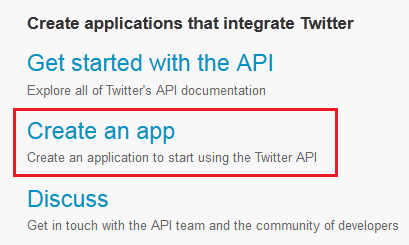 Go to https://www.twitter.com and, before logging in, scroll to the bottom of the page and select Developers. Then click Create an app to begin registering your gadget. Figure 8.22: Select the Developers tab on Twitter. Figure 8.23: Select Create an app from within the Developers page. Fill in the Name, Description, and Website fields with what you prefer. b. Finally, select the Create your Twitter application tab at the bottom of the page. Figure 8.24: Fill in Application Details to setup connectivity between your Twitter gadget and your portal. You are given the OAuth setting that you need to configure your gadget on Liferay. Copy the Consumer Key and Consumer Secret to your clipboard. Figure 8.25: Here are the Consumer Key and Consumer Secret (values are blacked out for security). Enter your Consumer Key and Consumer Secret under the Manage OAuth that you navigated to earlier. Also, select HMAC_SYMMETRIC for the Key Type and then click Save. Note: Liferay offers PLAINTEXT and RSA_PRIVATE as alternative key types. HMAC symmetric and RSA private are commonly used production key types, whereas plain text should never be used in real-world settings. Figure 8.26: Configure the settings for your Twitter gadget. Under Application Type, select Read and Write. Then click Update this Twitter application’s settings at the bottom of the page. 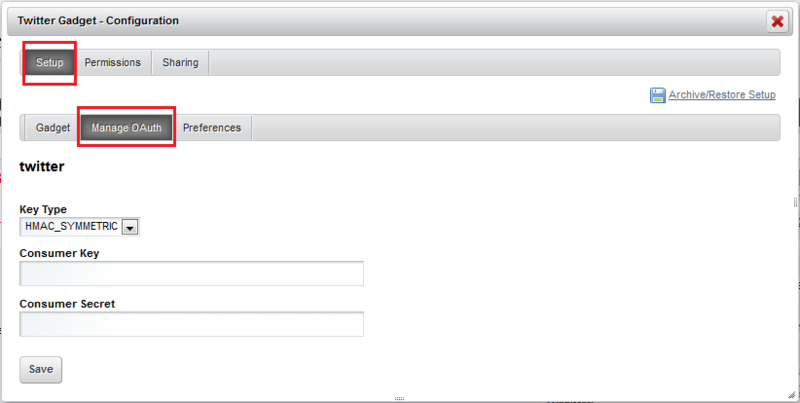 Figure 8.27: Select the Read and Write option to enable two way communication. Congratulations! Your Twitter gadget is now configured with OAuth. Next, we’ll configure the gadget within Liferay Portal. 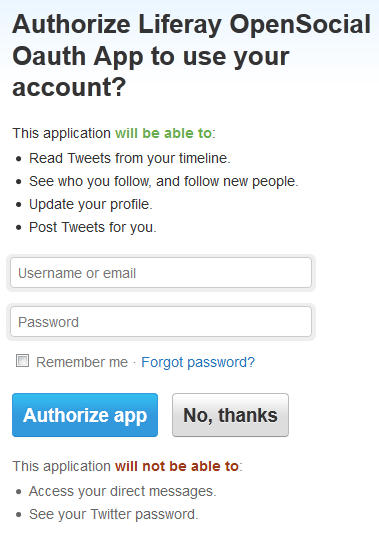 Now that your gadget is registered with Twitter and is configured with OAuth, you can add it to your Liferay Portal. The OAuth client you configured in the previous section allows users to protect their credentials while accessing resources on your site. For this section, we’ll demonstrate how to add the OAuth-configured gadget to your page. Figure 8.28: Your OAuth configured Twitter gadget awaits personalization with your Twitter account. Click on Personalize this gadget to be redirected to the service provider. Figure 8.29: Authorizing your OpenSocial application to use your account is straightforward. Figure 8.30: Check out your Twitter gadget timeline! 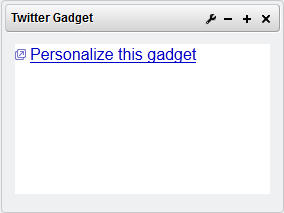 Using this gadget, you can tweet your current status and have it display on your Liferay site and Twitter page. To change the amount of tweets displayed, click on the wrench icon in the upper right corner and select Configuration. Under the Setup tab, you can type the number of tweets to display. Figure 8.31: Configure the number of Tweets to display. 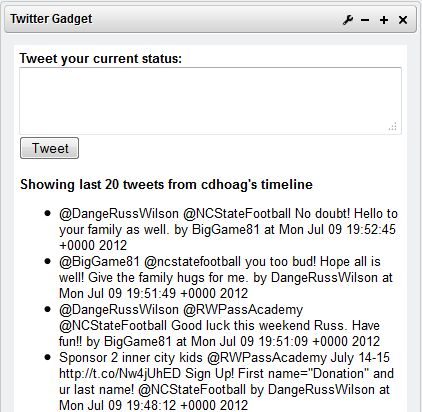 Lastly, you can tweet and view your Twitter timeline. The snapshot below displays what the Twitter Gadget looks like when tweeting. Figure 8.32: Here is your Twitter gadget just the way you like it! As you can see, OAuth is easy to configure and offers users the freedom to securely add valuable data from third-party sites. OpenSocial gadgets are XML documents, so as part of Liferay’s OpenSocial integration, a gadget editor is included. The gadget editor is a complete development environment for gadgets providing syntax highlighting, a preview function, undo/redo options, and built in tabs for working on multiple gadgets at once. You can also organize and manage gadgets through a simple file manager embedded into the portlet. To access the gadget editor, go to the control panel and click on OpenSocial Gadget Editor in the Content section. Once you have created and saved a gadget using the editor, click on the wrench next to the file to rename, delete, publish or get the URL for your gadget. If you want to display your gadget somewhere, click Publish to choose a category and display your gadget in the application menu or click Show URL to get a URL to display your gadget on any site that supports OpenSocial. In addition to the social interactions that you can create on your portal, Liferay can integrate with some other popular social networks. This enables you to leverage their power and popularity for your portal’s content.